Over the years our meetings were given the name 'la familia'. This has its origin in the warm bedding that we make together to let that 'be' what needs to be. In this space you can come home, develop yourself, be yourself, without judgment, without jealousy. People with a warm heart for each other, who leave each other space, feel each other and walk alongside each other as equals. Equality between young, old, man, woman across all borders. To support each other, to give hope, love and courage on this warrior's path. Here we throw off all masks and we are totally there for each other, in all honesty, authenticity, vulnerability and openness. This is what we think should be a 'Familia', this is what we create together here, over and over again, in all our circles that we hold together. The circle is constantly expanding, from one heart to another the spark jumps. Inside the flame is burning, the medicine is inside. The more we start to feel this and start to live ourselves, the more we are the living example that others can also mirror and go 'inside'. Together as one family we work on a better earth, step by step. Healing is a biological process that we follow in Integrative Medicine. The success of your healing depends on your neuroplasticity. If you believe and feel that you can change, your body will do likewise. The beautiful work of doctor Eduard Van den Bogaerde and his wife Judith Blondiau. An entirely new view of medicine through total biology. I would like to come to you on any occasion, ritual or celebration. Let's make it into a 'party. And what do you think of giving a circle as a gift or giving a workshop to friends? Two beautiful souls and good friends of ours: Chris and Kathleen. With their concept "free contribution" everyone gets the chance to do something beautiful for himself and his fellow man. For example, no one has to walk alone when life gets to you. Offer: Coaching, chakra healing, smudging of homes, massages, workshops and lectures and much more. One of the most important goals in my life is to contribute to the redemption of the suffering of all living beings and to be able to contribute to everyone's quest for a long and happy life. Specialized in: Foot reflexology, Deep massage, Relaxation / meditation, Natural dietary advice, Supplements and herbs, Lectures / courses. A good friend, a beautiful musician. Harplesses, Soundhealing, Coaching, Harp Music, Concerts and numerous creative projects. 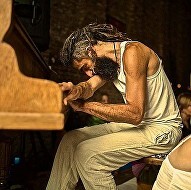 Dieter is a multi-talented musician, sound-healer, ceremony accompanist, singer and above all a good friend. Take a look at his website to feel what he can help you with. He plays repetitive chords & arpeggio’s reminding you of Philip Glass, and he hums & sings along as Glenn Gould” . A brilliant musician, a good friend...always playing from the heart. This is the project of Griet Heylen and Roel Crabbé. All their activities are aimed at bringing people into contact with their own soul connection and supporting them in the development and nurturing of a life that is supported by inspiration, joy, connectedness and strength. Therapist, speaker and co-author with Gerard Athias of the game "The 22 sparks of life" and the book "The Shoah inheritance" (Maintenance at the borders of a limit state). Above all she is a great friend. Nondual biodynamics and craniosacral therapy. Gerald is a beautiful 'healer' and cranio sacred therapist. We definitely recommend personal treatment with this special loving man. We women are a powerful source. Everything is already in us. I take you to discover this, led by Paqarina. Welcome, powerful woman! Chantal guides women on their path. The best store in Belgium for special folkloristic and ethnic instruments from all over the world. A great place for soundhealers.